Rollin' down the river with Proud Mary and her krazy krewe! : Cake...CAKE! 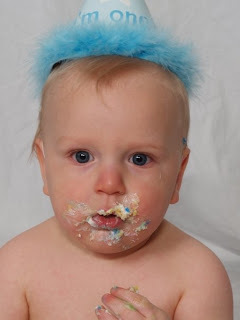 Noah loves cake. 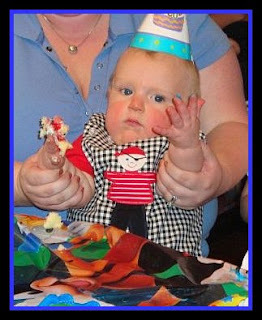 Just last year on Deuce's 1st birthday he had to steal the first piece of cake. Check out the pic. He adores it. It doesn't matter what flavor cake or icing...he just loves cake. Since he is obsessed with it I don't make cake/cupcakes often. Well, I decided to make something "sweet" this week after Noah somehow opened the fridge by himself and brought me over a can of cinnamon rolls. As he saw me take out the cupcake pans he screamed "CAKE! Mama...CAKE!". Who could resist this? Not me of course. He didn't understand that the cake had to bake so he just stood by the oven and kept on yelling for cake in the giddiest voice ever. It was pretty adorable. Well I made the cupcakes on Wednesday and he still won't let it go. He woke up this morning for cake...and yesterday when I got home from work it was not "Mama" he screamed but rather "Mama CAKE!". Is it so wrong if I throw the rest of them out? I can't believe this crazy obsession with cake. Thankfully there were 2 left as of lunch...I'm assuming when I get home they will be gone!